The most important thing to remember when applying stage makeup on kids is that you are only adding definition to what is already there. You don't want your child to look overly made up, older (unless the part calls for aging) or flamboyant. As long as your child is playing a child, you want the audience to be able to see her features from several yards away and in inconsistent lighting. Here are instructions on how to define your child's face using stage makeup. Apply a hypoallergenic facial moisturizer to the child's face about 10 minutes before using harsh stage makeups. Choose a greasepaint foundation that is one or two shades darker than the child's skin tone, and apply it evenly using a makeup sponge dipped in water and squeezed first. Be sure to apply the foundation all the way down the neck and on and behind the ears, as well. You want the color to be even all over. Use highlighter by applying a few dots at the top of each cheekbone and just below the eyebrow (not on the lid). Use your finger to gently rub it into the skin in a circular motion. Then use a pink or peachy blusher directly on and just under the cheekbone, starting from the bottom of the nose and sweeping in an upward motion with the blush brush to the hair line. Use a lip liner that is at least two shades darker than the child's lip color, and line the outer edge of the bottom lip and top lip. Fill the lips in with a dark pink or light red lipstick. Do not use bright red lipstick unless the audience will be very far away from the stage, as it will make the child look harsh. Blot the lips on a paper towel so that the color does not run or smear. Apply light blue or violet shadow to the child's eye lid and underbrow. Use a darker color---blue, purple or brown---in the crease of the eyelid, extending beyond the natural line of the eye in an upward motion toward the temple. Use a dark liquid or grease liner to outline the top of the eye, just above the lashes and extending the line at the outer corner in an upward motion toward the temple. This will make the eye appear larger and more expressive. Start the bottom outline in the middle of the bottom lash line, and extend it beyond the lash line and toward the temple, just underneath the top line. Apply a dark, waterproof mascara on the top and bottom lashes, and allow the lashes to dry for a few seconds before blinking. Brush translucent powder or a powder that is one shade lighter than the foundation over the entire face and neck, including the lips. Use a powder brush or a puff for this. The powder should keep the makeup from running under the lights. Pull the hair back with a headband or into a ponytail while applying makeup. Check the lead content of the lipstick before using it on young children. Many of the darker lip shades contain high concentrations of lead and may be dangerous to use on children. Be sure to clean brushes before using them on another child. 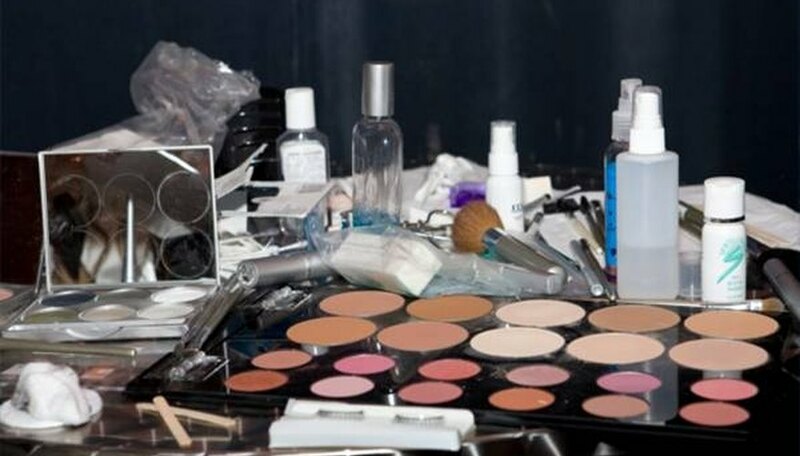 Sharing makeup and brushes can spread skin and eye infections. Never allow children to share eye liners, mascaras or eye shadow brushes! There are several viral and fungal infections that can be easily spread by sharing eye makeup and brushes.